Alan Peters, whose death aged 76 after a long illness has saddened a whole generation of furniture makers, was widely regarded as the father figure of not only Arts & Crafts furniture but of superlative craftsmanship executed in a style that was recognisably his alone. He joined the Edward Barnsley workshop as a 16-year-old apprentice, then undertook teacher training in crafts, gaining a distinction and a scholarship to the Central School of Art and Crafts, London to study interior design. In 1962, at Grayshott, Hindhead, Surrey, he became established as a designer-maker of modern craft furniture, moving to Kentisbeare, Devon 11 years later. In 1975 he visited Japan on a Crafts Council bursary and in 1981 went to South Korea and Taiwan on a Churchill Fellowship. He was awarded the OBE in recognition of his work and was the author of the definitive Cabinet Making: The Professional Approach, now reprinted. His work spans designs that show the profound influence of the Far East in their simplicity, and other work which is richly detailed but always with his very crisp touch, demanding techniques that exacted the utmost from his apprentices. When Alan Peters took part in an exhibition celebrating the life and work of that precursor of the Cotswold Men, William Morris, he would have been doing so because, like Morris, he believed not just in making beautiful objects, but in human lives being lived productively. 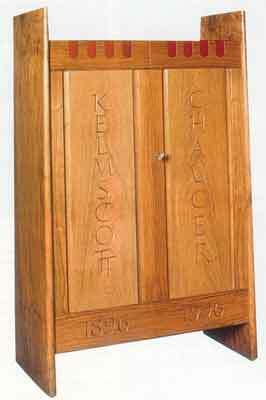 In 1994 he had been approached by the Keatley Trust to consider making a 1996 version of the CFA Voysey original 1896 Chaucer Cabinet. He told F&C then that he was excited, but somewhat overawed, by the significance of the task. And so the Kelmscott Cabinet, named in commemoration of the Kelmscott Press founded by Morris, came to life and can be seen today at Cheltenham Museum. He said then that no-one would ever believe the hours they had put into the cabinet. People could not conceive the fact that 900 hours went into making the piece, all the planning, the discussions, the working out of problems, he said. He was joined in the making of it by apprentices, later makers at his workshop, Steve Hopper, now Furniture Programme Manager and lecturer at Bridgwater College, Somerset, and Keith Newton, also now at Bridgwater. Peters never formally retired and indeed was still making up to 2003. His standards of workmanship were legendary and only last year we reviewed a Rob Cosman DVD in which Peters demonstrated the right way to achieve perfect dovetails, passing on tips he had worked out for himself over more than 50 years of cabinetmaking. Alan Peters was a true master of our craft. He will be sadly missed but his legacy lives on in others. He died on 11 October, 2009, leaving his wife Laura and children David and Christine. Alan Peters travelled widely and absorbed ideas from the Far East to create his own personal style. Despite this influence his work was still quintessentially English and restrained and he always adhered to the highest standards of craftsmanship. Fame did not go to his head and he was never pretentious. Alan was very self-absorbed about what he was doing. I learnt a lot from him. He got me to do things by hand and he supported his apprentices. I remember I had the job of sanding the flutes on one of his console tables. He had made it out of laurel so it was very hard work. He has been an influence on whatever we have done since.